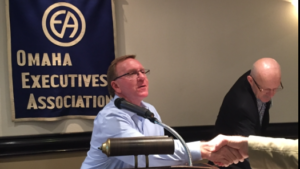 Kevin Kuta, President of Quality Glass & Mirror, spoke recently to members of Omaha Executives Association (OEA) about the history and services offered by Quality Glass & Mirror. Kevin founded the company in 1985 and has been a member of OEA since 1992 and OEA past president in 2004. Kevin co-founded the company in 1985 and shared the history of growth of the company with the group. Quality Glass & Mirror now serves wholesale and residential customers in a six-state region. Explanation of the various types of glass, including tempered, insulated, spandrel, laminated, patterned and painted. Adding glass features in homes and offices are becoming increasingly popular. Quality Glass & Mirror has top-of-the-line equipment and machinery, and an experienced team of experts that are ready to create custom glass projects for your residential or commercial needs. We invite you to visit our showroom, or call us with questions!